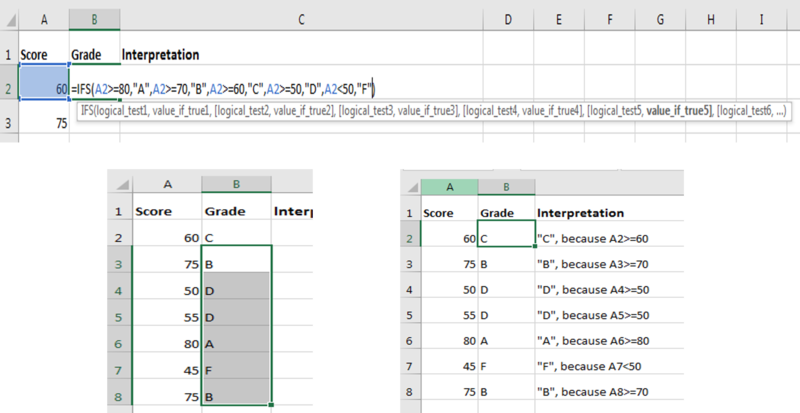 I am pleased to introduce you to some of the New Excel Functions in Excel 2016. The functions I will be introducing in this tutorial are TEXTJOIN, IFS, SWITCH, MAXIFS and MINIFS. As the name implies, this function is used to concatenate a list or range of text. It also places delimiting character(s) like the comma or space, between each field that it joins together. It is used to join text strings. The delimiter – this is the character you wish to separate the text string with. It could be a space, comma, or any other character. The ignore_empty – If ignore_empty is TRUE, then TEXTJOIN ignores blank cells in the result of the result of the formula. 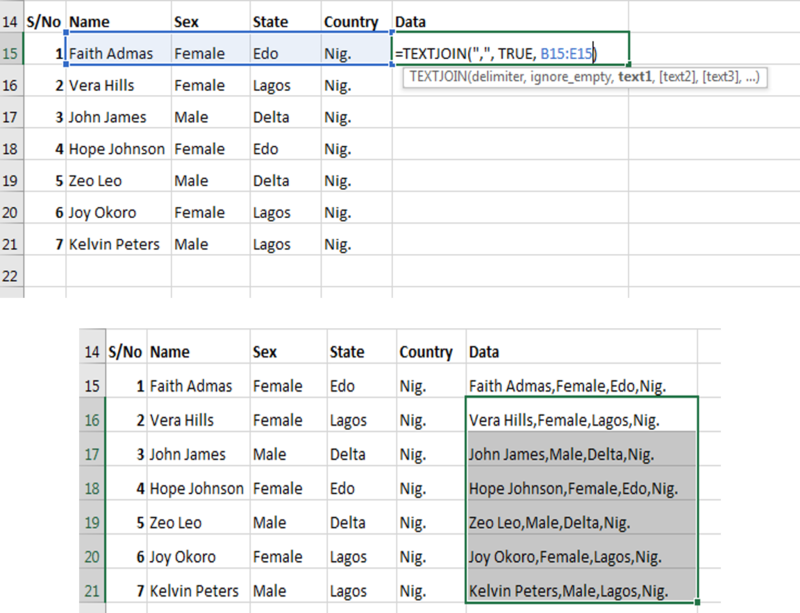 But if FALSE, then TEXTJOIN includes the blank cells in the result of the formula. The picture above shows the use of TEXTJOIN to concatenate four columns of data into one. The IFS Function is like the IF function, except that it allows you to check whether one or more conditions are met and returns a value that corresponds to the first TRUE condition. The IFS Function can take the place of many nested IF statements, like “IF(IF(IF(IF())))”, though it can be confusing and be challenging at times. Using the IFS function have some advantages, one of which is that you can specify a series of conditions in a single function. For a score of 80 and above, the system is to record A. A score of 70 and above, the system records B, and so on. But for a score below 50, but not equal to 50, the system records F.
It is important to note that this function (IFS) only permits you to test up to 127 different conditions. Up next is the SWITCH function. The SWITCH Function can also handle many conditions like the IFS Function. The difference between the SWITCH and IFS Functions is that, instead of specifying a series of conditional statements like in IFS, you specify an expression and a series of values and results. What does the SWITCH function do? 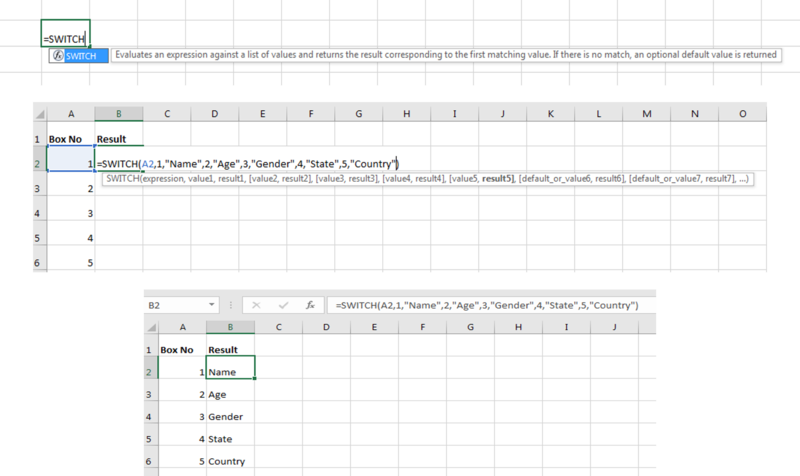 The SWITCH Function check a single expression against a list of values, then returns the result that corresponds to the first matching value. put: the SWITCH function first looks for the value, matches it and then return the results. One merit of the SWITCH Function over the IFS Function is that you can avoid repeating the expression. An example of the SWITCH Function is shown in the picture above. Note the function (SWITCH) allows list up to 126 values. 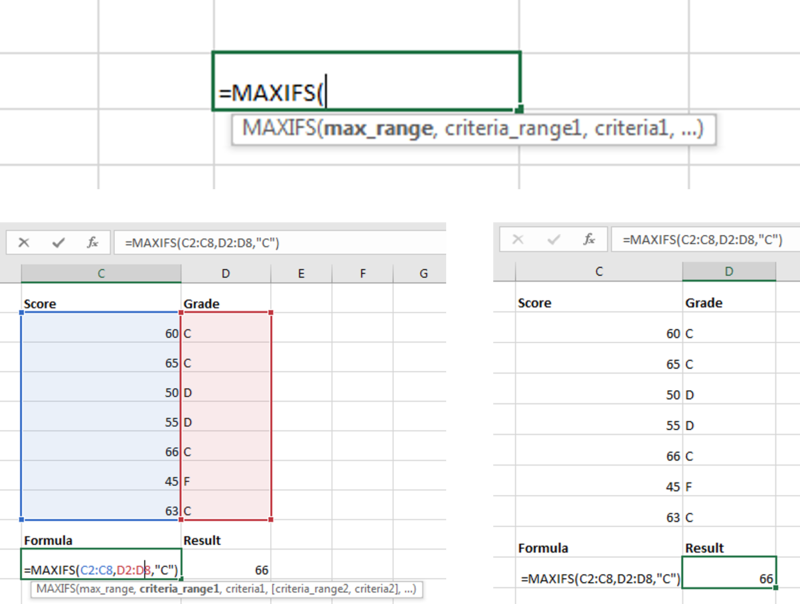 The MAXIFS Function returns the largest value among cells specified by a given set of conditions or criteria. 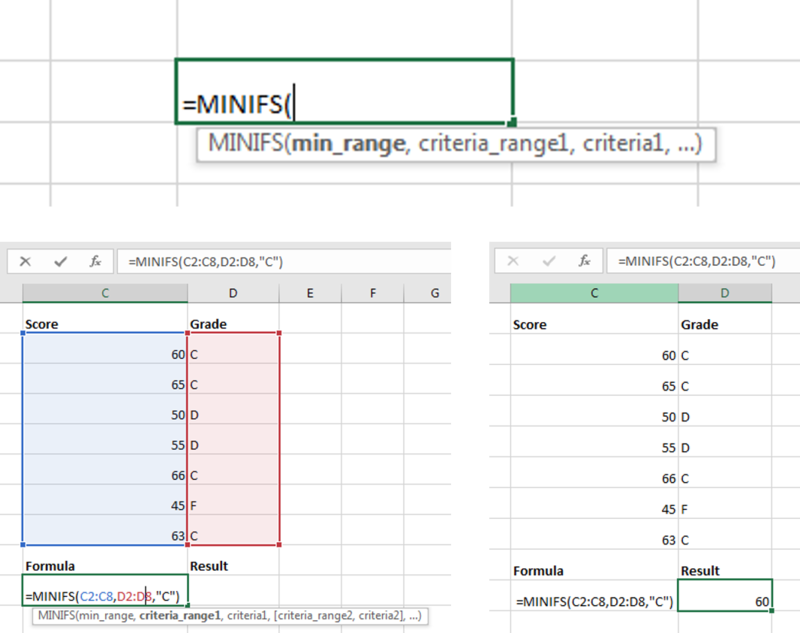 While the MINIFS Function returns the smallest value among cells specified by a given set of conditions or criteria. They are the opposite of each other. With MAXIFS and MINIFS, you can specify several conditions. The conditions help in filtering the data before calculating the largest or smallest values. 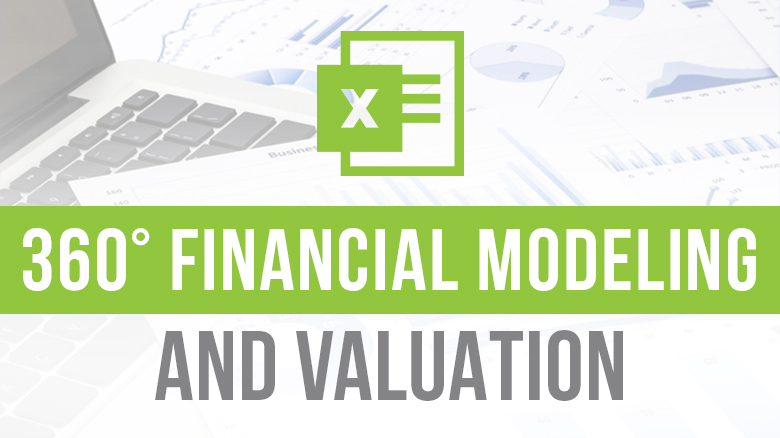 criteria1 – criteria which will be evaluated as largest. It could be in the form of a number, a text or an expression. From the above, the max_range is C2:C8, while the criteria_range is D2:D8. In the criteria_range, the 1st, 2nd, 5th and 7th cells match the criterial of “C”. From which the one with the largest value was the 5th cell, hence the result is 66.
criteria1 is the criteria which will be evaluated as smallest. It could be in the form of a number, a text or an expression. From the above, the min_range is C2:C8, while the criteria_range is D2:D8. In the criteria_range, the 1st, 2nd, 5th and 7th cells match the criterial of “C”. Of which the one with the smallest value was the 1st cell, hence the result is 60. The size and shape of the max_range/min_range must be the same as that of the criteria_range, if not the function return the Error Value. You can only enter data range up to 127. 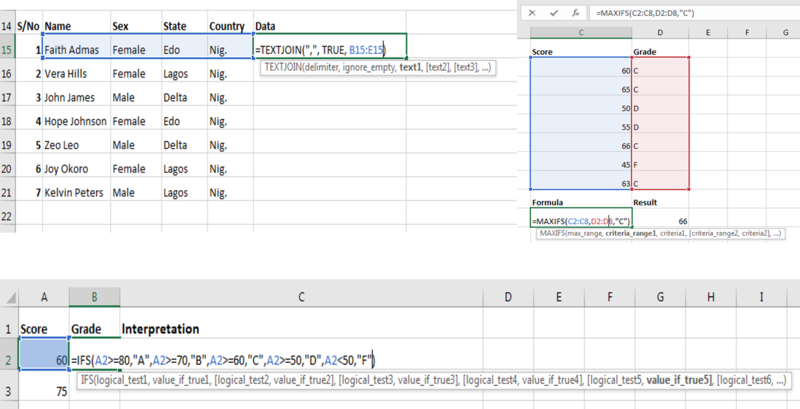 In this tutorial, we have introduced five new excel functions in 2016. In subsequent tutorials, we will be picking these functions, one or two at a time to throw more light into them. In the meantime, why don’t you try on these functions. Remember, it sticks better when you practice!